MacLellan Rubber offer a number of SBR Rubber Sheeting materials to meet the commercial requirements of our global customer base. SBR Rubber compounds are often used instead of Natural Rubber for their higher wear characteristics, and better low temperature flexibility. However, SBR compounds are not suitable for applications that involve chemicals, ozone, strong acids, oils, greases, fats and most hydrocarbons. Typical applications include wear strip and impact pads in production lines, grommets and cable seals, and applications where bonding to substrates is required. In one form the compound is even used in the production of chewing gum. 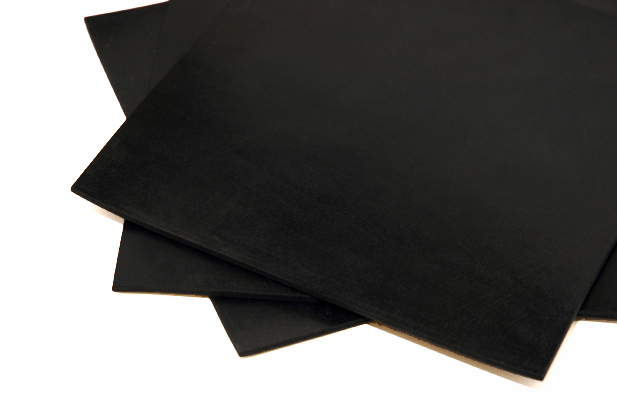 Our commercial SBR Rubber Sheeting products are available in a limited range of shore hardness’s from 60 through to 80 Shore A and offer a level of physical characteristics, such as Tensile Strength and Elongation at Break, that conform to the general standards of commodity materials of this nature. SBR compounds are widely mixed with other Polymer grades as a method of keeping down the overall cost of a material, consequently you will see many of MacLellan’s commercial materials are defined as blends examples of which include NR/SBR (Neoprene SBR blend), NBR/SBR (Nitrile SBR Blend). Combining these polymers does not detract from the general performance of the main grade and in many instances will improve some properties of these commercial materials. Note that there are no European or International standards that SBR Rubber Sheeting materials are required to meet and the compound is not available as a FoodSafe grade. SBR compounds are typically Black but are available in a limited number of colours including White and Red, subject to minimum production quantities. Typically supplied on the roll, our SBR Rubber sheeting can be easily cut into sheets, strips or gaskets using the appropriate equipment. SBR is the common abbreviation used for Styrene Butadiene Rubber a synthetic polymer originally developed by Walter Block in 1929, and subsequently commercialised by Goodyear for the manufacture of car tyres. SBR is sometimes confused with thermoplastic elastomers (TPR’s) made from the same monomers, styrene-butadiene block copolymer.